Our "Country Meadow" Collection has all of the feelings and elements to remind you how relaxing it is to be out in the country! The rolling hills, the cute girl picking wildflowers and of course her best friend...her dog is with her. Where is your place?? Is it your backyard or garden, or is it a favorite person you know who loves it. 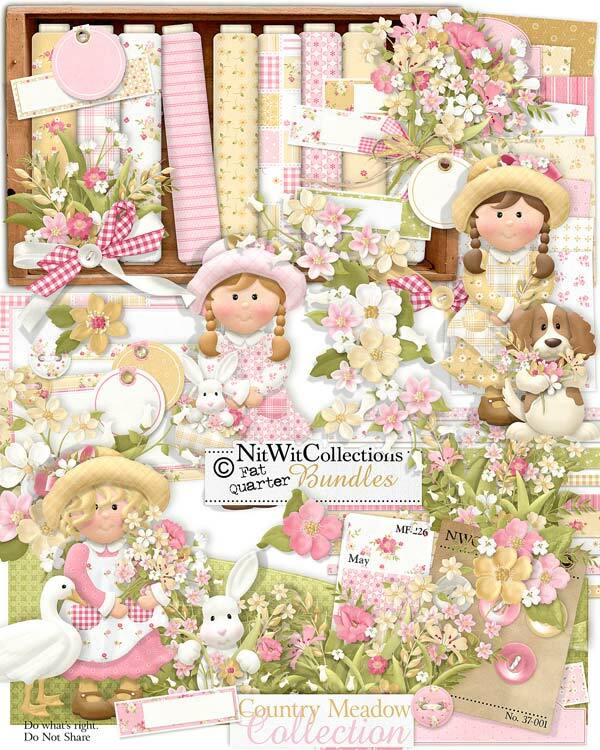 There are so many options with this kit be it a picnic, a layout or card for your daughter or friend, something about your puppy outdoors or just a pretty floral look....Soak in the sun and maybe take some time to spend in our Country Meadow....you won't regret it! 1 Bouquet of flowers...no allergens! 1 Dog - now we all know that I love more....but even to have one dog is bliss in my books! 3 Flower clusters...you can't get enough pretty flowers for me! 1 Goose ready to follow...did you bring your loaf of bread to feed her?? 6 Journal Tags - blank...what do you want to put in these?? 1 Rabbit thinking he's hidden in the flower thicket....can you spot him? ?